The goal of the government is to guarantee the place of Greece in the eurozone against those who want to undermine it. Our problem is not adopting reforms, which we will do without question. It is not reaching an objective, which we will meet. But it is finding an end to the recession. Difficult years lie ahead, patience is required. The government is determined to bring the program back on track, and proceed with the privatizations. We must adopt the measures included in the second loan in February so that we do not threaten the release of this loan. 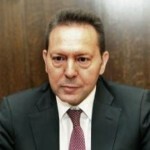 Yannis Stournaras, is a Greek economist who has been the Greek Minister of Finance since July 5, 2012. Stournaras is a graduate of the Finance Faculty of the University of Athens, and has an MSc and PhD in Economics Theory and Policy from Oxford University.